Set to compile the largest biodiversity data collection for Europe to date, the EU-funded FP7 project Building the European Biodiversity Observation Network (EU BON) has now launched the beta-version of its European Biodiversity Portal. Despite being a beta version, this release already addresses the main aim to offer a unique service for analysing and understanding biodiversity change in Europe. For instance, users can explore how relative abundance of species (within a larger group) changes over time by using big data mediated by GBIF. There is also a spatial browser for locating datasets in any part of the world, which may be usable for computing the EBVs for species populations. Additionally, an online analytical data processing (OLAP) toolbox has been included in this release. Based on GEOSS technology, the new portal lets users harvest and simultaneously access data from several directories, including GBIF, LTER, EuMon (coming), PESI, and GEOSS sources. 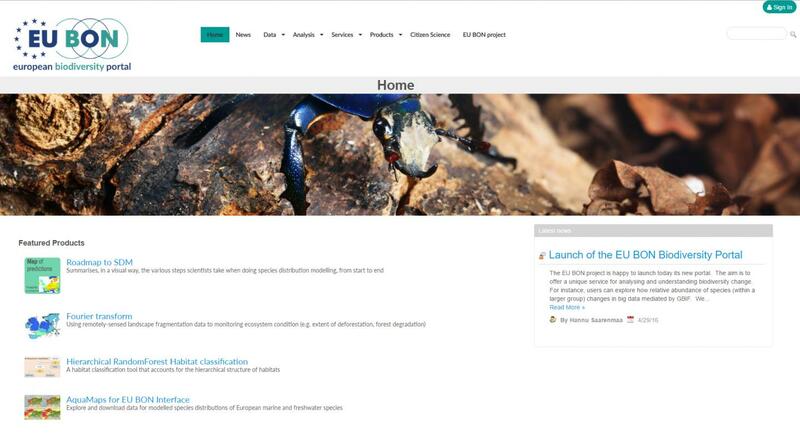 Started in 2012, the five-year project EU BON has been working towards building this new European Biodiversity Portal where scattered and various information and tools are collected, highlighted and widely shared for future research. The service will provide all interested parties with a professional database platform with a large amount of implications. For example, coordinators can receive information about related monitoring programs in different countries. Initiatives could integrate their data and compare the trends and status across different countries and regions. "The ultimate goal of EU BON is to build a comprehensive European Biodiversity Portal that will then feed into a Global Portal currently developed by GEO BON. This initiative will provide a completely new holistic way for analyzing global trends and processes. ", concludes Dr. Hannu Saarenmaa, University of Eastern Finland and Work Package leader in EU BON. We invite everyone to test the new portal and send us their feedback and suggestions for improvements via our Feedback Form.